Ant McPartlin’s estranged wife Lisa Armstrong has worried fans after liking a string of cryptic social media posts on Twitter. Ant, 42, and Lisa, 41, are divorcing after 11 years of marriage and 23 years together, with the couple announcing their split via a statement. The pair have remained tight-lipped with regards to their private lives – but supporters have noticed Lisa’s twitter activity makes some shocking implications regarding her estranged husband. 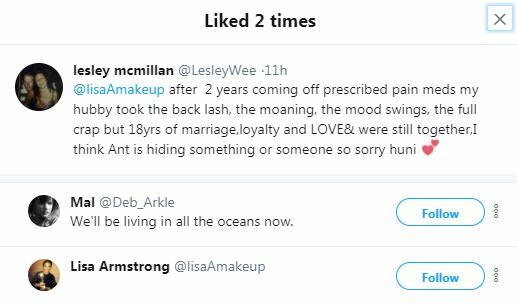 One tweet liked by the Strictly Come Dancing make-up artist suggested that Ant was ‘hiding something or someone’. @lisaAmakeup after 2 years coming off prescribed pain meds my hubby took the back lash, the moaning, the mood swings, the full crap but 18yrs of marriage,loyalty and LOVE& were still together,I think Ant is hiding something or someone so sorry huni [sic]. The Sun always shine after the storm. Love yourself. Lisa this is a new chapter in your life journey. One day they’ll realise they lost a diamond while playing with worthless stones. On February 13 a statement from Ant’s spokesperson announced he and Lisa were officially divorcing. In response to the recent speculation in the media, Ant is very sad to announce that, after 11 years, he is ending his marriage to Lisa McPartlin. Ant asks for privacy at this difficult time, for both himself, Lisa and their immediate families. Ant and Lisa met in 1994, and married in 2006 after 12 years together. Lisa’s twitter activity comes after National Television Award viewers, who apparently haven’t noticed men and women can be colleagues without being romantically involved, predicted a romance between Ant and fellow ITV stalwart, Scarlett Moffatt. A rep for Ant put paid to the rumours and called them ‘total bullsh*t’. 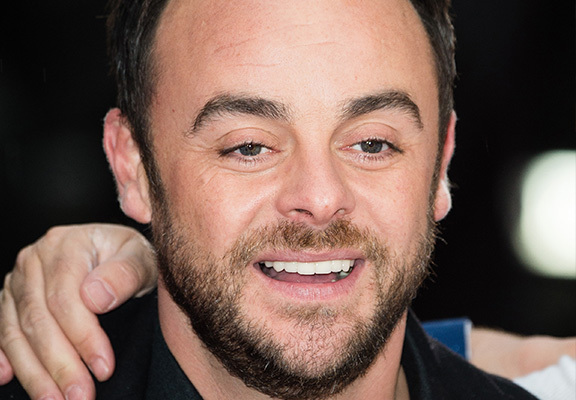 2017 was a tough year for Ant McPartlin, as well as his nearest and dearest, and 2018 doesn’t look like it’s going to be any easier for the estranged family. McPartlin checked into rehab last summer – battling an addiction to prescription drugs and painkillers – and reports suggest the ordeal put an irreparable strain on his marriage. 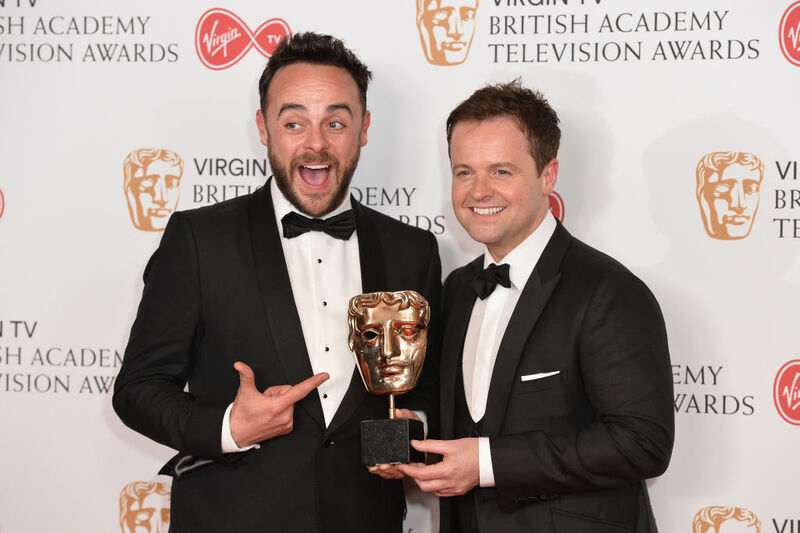 Ant bravely battled his addiction and got back to good health, in order to carry out his presenting duties with lifelong partner and friend, Declan Donnelly, after Dec refused to host I’m A Celebrity without Ant. They took to the jungle once again to present and pulled it off with their usual flair and comedy stylings. Since it has been revealed McPartlin has plans to pay Lisa £31 million in a record-breaking celebrity divorce settlement. The presenter is willing to part with half his fortune upon splitting from his wife in the name of an amicable divorce. Ant, who also hosts Saturday Night Takeaway and Britain’s Got Talent, is estimated to be worth £62 million. As his best friend embarks on the trials and tribulations of divorce, Declan Donnelly is also faced with a difficult decision and told a friend he feels ‘torn‘. 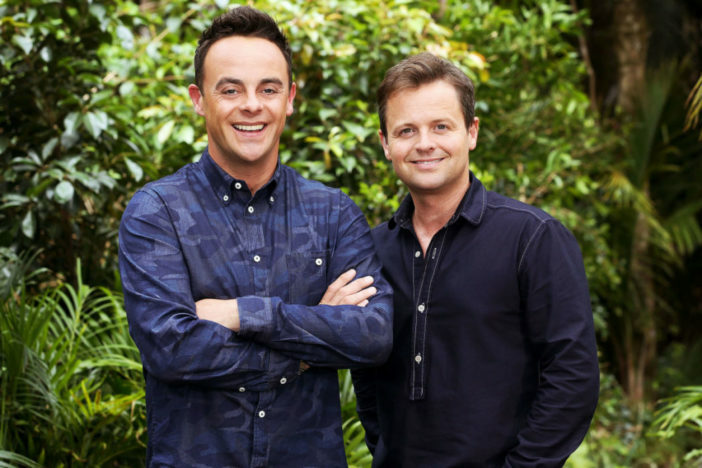 As we have seen, Dec is loyal to his long-time partner and friend Ant McPartlin, but as their lives have meshed together as close confidants and colleagues, so have those of their wives, Ali Astall and Lisa Armstrong. He feels very much torn as the sad news of Lisa and Ant’s divorce was announced, and it’s a tremendously difficult situation for all concerned, after his own wife has become ‘a shoulder to cry on for Lisa’. Let’s hope they can all get through the tough times ahead.